Santa Clara County officials Tuesday released a video they say shows a worker being blasted from a manhole by a steam explosion a year ago at the Valley Medical Center earthquake retrofit project where they accuse the contractor of safety lapses and costly delays. This video is actual footage taken at the Turner Construction site at a Santa Clara Valley Medical Center on Sept. 3, 2014. 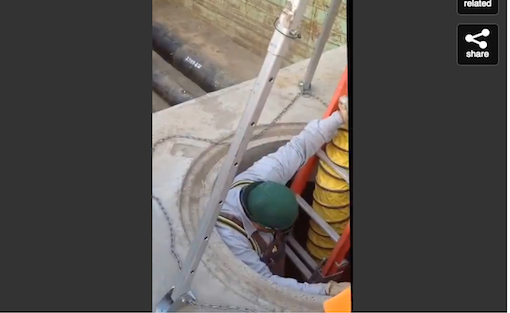 The video shows workers activating the steam system for the North Utility Loop which provides steam and chilled water to the facilities at Valley Medical Center. During the course of the process for starting the steam system, the audio clearly demonstrates a loud popping sound, followed by verbal concerns expressed by crews on site. Then, after over a minute of the audible popping noises, as a crew member attempts to escape the underground vault, the pipe explodes discharging boiling hot steam. Hey Joel you moron! We told you to GTFO of the manhole like 5 times. Maybe you don’t remember because you have a concussion explosion of hot steam blast and fried your dome but here’s a quick reminder in case you forgot. It was a little bit after everyone heard those eerie sounds of something popping that the whole crew said they didn’t like that sound and people shaking their heads no. Then after that you proceeded to get out and still hearing popping weird sounds you stopped climbing out half way just to look down like an idiot and thats when you proceeded to get face fucked by the most violent force of steam ever. This entry was posted in Uncategorized and tagged blast, face fucked, GTFO, Joel, manhole, Santa Clara, Santa Clara County, Santa Clara Valley Medical Center, steam, Valley Medical Center, Valley Medical Center earthquake retrofit project on September 2, 2015 by edlee.